How I began my journey with Golang on a Raspberry Pi running Docker and had my first real world application working within the afternoon: a client for my connected display server. Follow me step by step along the way. The Blinkt! 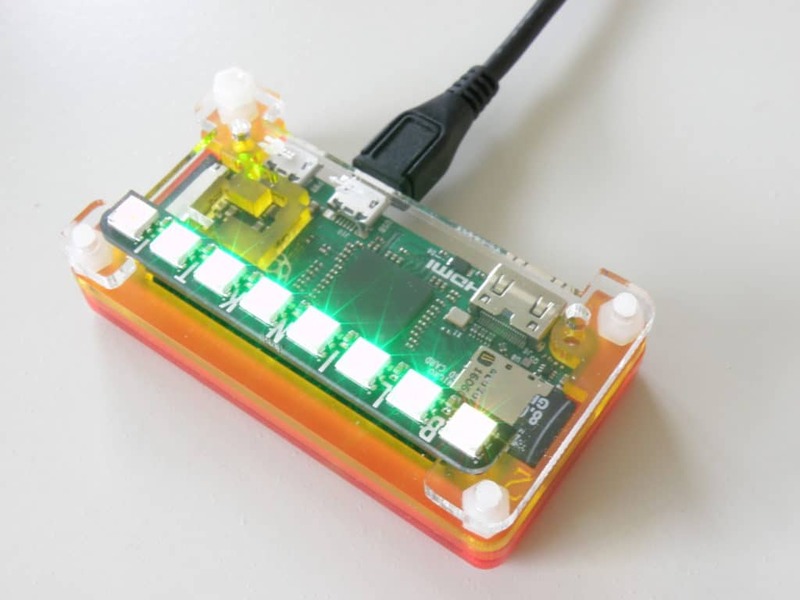 is a little add-on for the Raspberry Pi. It’s compatible with the Raspberry Pi’s 40 pin header. In a small form factor, that sits nicely on top of the GPIO Header, it provides Eight individually addressable RGB LEDs. Cool thing: These LEDs do not interfer with the Pi sound output. 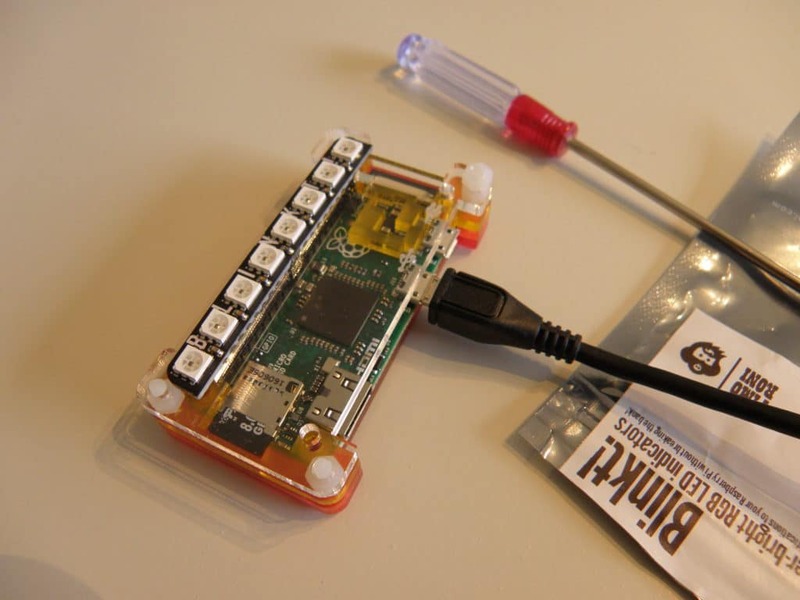 The manufacturer, @Pimoroni, provides a Python library with setup details on Github. Go is a popular programming language created by Google. It’s a compiled, statically typed language that targets ease of use and adoption. The Blinkt! libraries have been ported to Go by @AlexEllisUK, so you can go straight ahead and use them in your projects! How easy is it really to try and learn Go? I do know a few programming languages, but I never gave Go a try, yet. 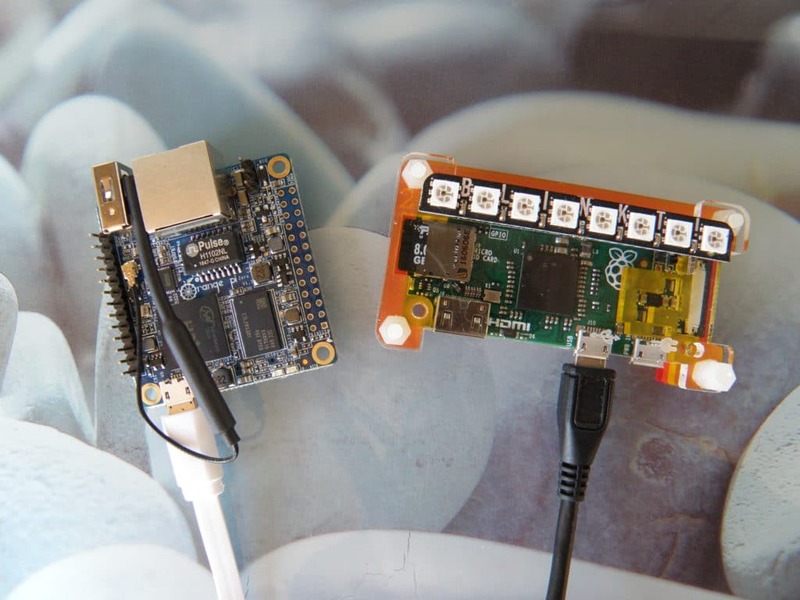 Let’s take our Raspberry Pi for a walk, then! As I didn’t want to fill up my base image with a bunch of files and dependencies, I used Docker to safely play and test in an isolated container. docker build -t actuino/blinkt-go-dev-armhf:1 .
docker pull actuino/blinkt-go-dev-armhf:1 No need then for the ‘git clone’ command nor ‘docker build’! Note 2: I tested the Blinkt! on a Pi Zero. Nice toy, but not the best when it comes to CPU power. As the build took too much time, I simply build and pushed the image from a 4 cores Orange Pi Zero (took about 10 minutes) and then just pulled the image from the Pi Zero. Side by side, an Orange Pi Zero and a Raspberry Pi Zero with the Blinkt! It worked on the first try: a red light bouncing on the Blinkt!, Cool. Now, am I able to do more ? I simply edited the app.go code from the container itself. See from behind a plastic diffuser: Catch the glowing worm! Let's Go further, shall we? Did I learn Go yet? Not so sure. Just a first contact, that went pretty well. But I had another idea in mind. Remember the Minecraft experiment we did, and our 'Unicorn' display with a client and server? The Unicorn Connected Display uses a 8x8 or 4x8 LED array. Why not 'extend' it to the Blinkt! 1x8? I felt pretty optimistic. In fact, all I needed was a WebSocket client, some code to copy/paste, maybe a Stack Overflow tab and it'll be ok in a snap. Really? Was it so simple? Our Unicorn server (NodeJS) relies on the Socket.Io WebSocket library. A Google search showed several libraries of interest. I tested 2 good candidates with the display server. Note: the Unicorn Server has a Raspberry Pi Docker image too, docker run -d -p 80:80 actuino/unicorn-server-armhf:1 so it was easy as Pi(e) to run and test against. When importing a new library in a Go project, no need to fetch the code yourself: You just add the name of the library in the code, then run a go get -v -d and it'll fetch the code itself. Then a simple go build (may take a few minutes) and you end up with an executable file named from your folder, that you can run or ship. Look Ma, my first Go program! Once I got a working client prototype - thanks to the examples - it was just a matter of mashing up the display and client code. Good news! The Unicorn Protocol I designed use simple Json data payload, and Json is well understood by Go, nice! And yes, I had to use Stack Overflow and did a few copy/paste. The final code is available on Github: Star and clone the code, then try it for yourself, Here is the readme with a step by step how to. It took an afternoon to install, test, and play with Go on the Pi and to have a first (non trivial) program working. Mission accomplished without friction, I'll play with Go again. A flashing light when the Pi Zero W are in stock again at your favorite reseller! And more, stay tuned and tell us your ideas! More about Go on the Raspberry Pi? Check Alex's blog: he published several blog posts about Go, Docker, Testing in Go, including a tutorial to fetch Json from an API: a must read! Next step for our code? Use Go Tickers and channels to enable smooth animated displays. You can join the conversation and comment/upvote on reddit too.